Looking for a high chair? 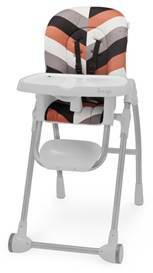 Check out the Snugli High Chair ($139.99) at Bed, Bath and Beyond. It’s designed with a crisp white surface and chrome tubing, making it easy for wipe down and cleaning! It has an adjustable seat (6 height positions, 3 positions for reclining). The tray also removes and is dishwasher safe – I don’t think I need to tell you guys how invaluable that is! Believe it or not, our first high chair (almost 9 years ago) didn’t have that feature so with baby #2 we got one and it truly saves tons of clean up time! Holds up to 40 lbs and it’s available in four unique styles: Geo, Pink Geo, Black Camo and Quilted. Love the options – I think they look unique to some of the other high chair styles you see on the market! You can purchase the Snugli High Chair ($139.99) at Bed, Bath and Beyond. Disclaimer: I received a sample high chair to facilitate this review. As always, all thoughts & opinions are my own.